In 1924 violin maker Franz Sandner founded his company in Schönbach. 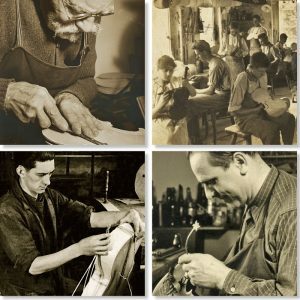 With the patiently acquired skills and natural love of craftsmanship, precision and artistic perfection Franz Sandner was able to establish its position on the world market quite quickly. After the Second World War the company moved to Nauheim. In 1958 Franz Sandners daughter Sonja and her husband Richard Schuh joined the company and established the foundation to enter the worldwide export market. In 1979 their son Dietmar Schuh – the third generation – took over Franz Sandner Co. and achieved continuous and sustainable development. Since 1992 Soraya Schuh has supported her husband. Today, Franz Sandner Co. sells instruments in 60 countries worldwide.